The company H&R – the specialist on suspensions has decided to build a car that can beat 400 km/h. Compared to old Porsche 997, the H&R model is far different. I think there’s no unchanged component part. The exterior was totally reworked and changed. They’d started with the roof that is now 75 mm lower and this means better aerodynamics. The H&R slimming includes removing of everything unnecessary and implementing of carbon parts. Everything unnecessary made space for a roll cage and sporting seats with multipoint safety belts. Most important changes were made in the engine of course. Everything there was replaced with something better and more durable. A stock 3.6 V6 boxer engine was extended to the 3.8 liter beast with everything best available. Two turbos work with 1.5 bar and guarantee the maximum output of 775,7 kW (1054 hp) at 7700 rpm and monumental torque of 1030 Nm at 5800 rpm. The power of this four-wheel monster is transferred by an over-elaborate 6-speed transmission. Traction properties are secured with new 19“ alloy wheels BBS, reducing air-turbulences on the ride’s sides and improving grip of the car also thanks to the special high-speed tires. Despite the fact that engine of this Porsche is using special 100-Octane premium gasoline, it meets conditions for EURO IV emission standard. EURO IV is set of emission standards applying to new road vehicles sold in the EU from 2005 or later, it limits petrol passenger car to 0.08 g/km NOx. The top speed measurement and attempt try to beat magical 400 km/h will take place in Italian Nardo in the first half of 2007. 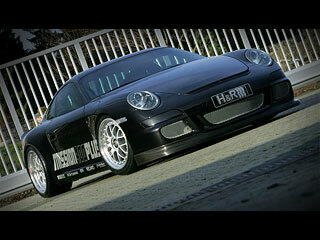 How do you like this Porsche 997 Mission 400 Plus bullet?